I am so excited to share this Custom Hollywood Theme Bat Mitzvah Place Card Holder/ Seating Arrangement I designed for one of my clients. I had to wait till the party is over before I could blog about this. Hollywood depicts glamour, glitz, fun, excitement, action and entertainment. 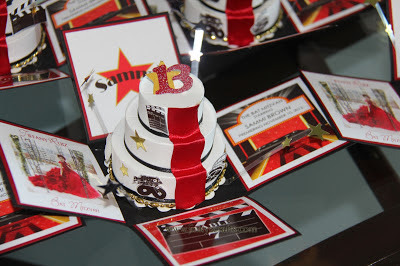 That's why Hollywood Theme Invitations are very popular for Weddings, Bat Mizvahs, Quinceañeras, and Sweet 16s. This Hollywood Seating Arrangement or Hollywood Place Card Holder can serve as a Hollywood Gift Favor as well. 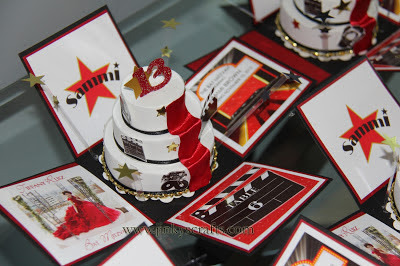 This Unique Hollywood Design is a collaboration of Jinkys Crafts Support Team and our Client. 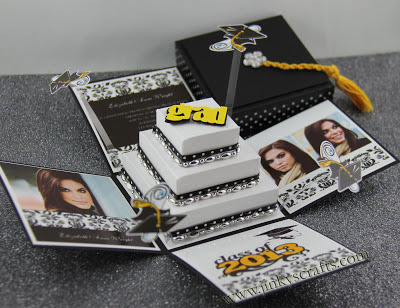 Jinkys Crafts Team helps you make your dream design possible. 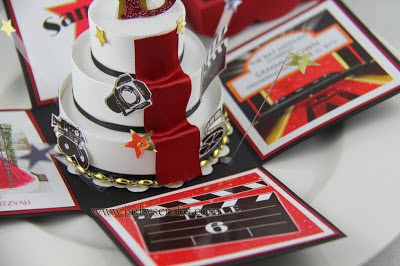 Here's the recipe of this Hollywood Exploding Box Seating Card Holder. Top Panel, is a custom Bat Mitzvah logo that our Client had provided. The Bottom Panel is a Hollywood Clapper that bears the seating #. 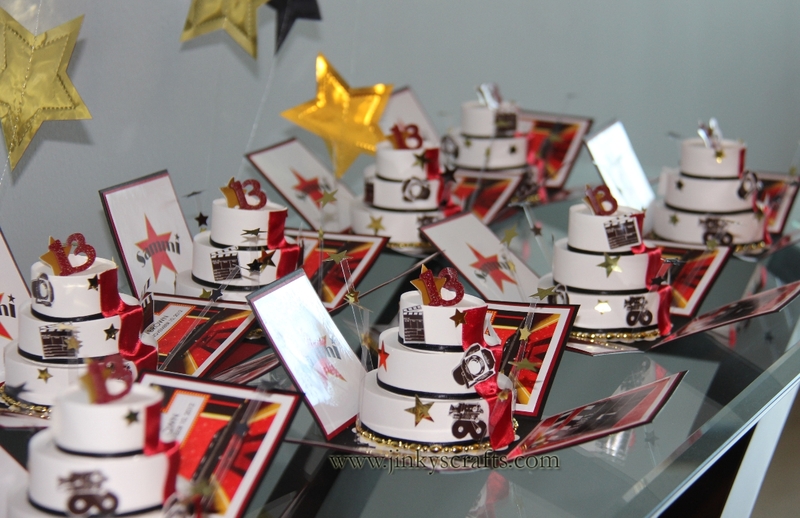 And the Left Panel is the photo of the celebrant. And the center of attraction is the signature design of Jinkys Crafts . A well decorated Hollywood 3-Tier Cake surrounded with floating pop-up stars. 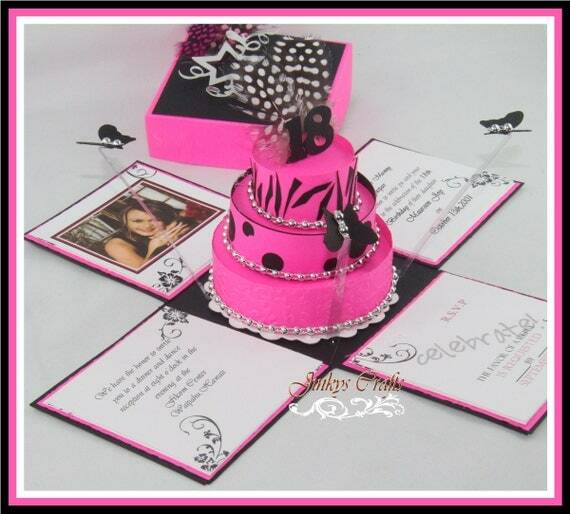 This is one-of-kind Place Card Holder or Theme Party Seating Arrangement. I hope I inspired you today and feel free to comment or email me if you have any suggestions or inputs you want to share. 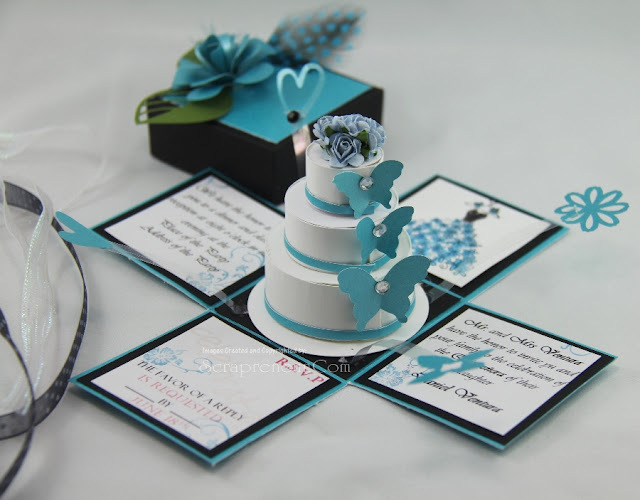 like the card holder idea..look so beautiful in this color..thanks for sharing it..as i might need it when use this..